Dubai, Nov 23 - On Jan 4, when Burj Dubai, the world's tallest building at 818 metres, is officially opened, the Indian expatriate community in this glittering Gulf city can rightfully bask in reflected glory. It is estimated that about half of the 13,000-plus people who sweat and toil on the project every day are from India. And it is not only the labour. There are scores of Indian supervisors, technicians and engineers working round the clock to ensure that the much-delayed Burj Dubai is completed and is at its spiffiest best before opening day. Among them is Rajam Krishna Moorthy, a manager with the US-based Turner Construction that is overseeing a part of the over-160 floor Burj project. A Dubai veteran of 15 years, Moorthy, who is originally from Chennai, has worked on nearly a score of the tallest buildings in this "City of Gold" - which has a thing for tall buildings and boasts of over 40 that are 200 metres or higher. The $1.1 billion Burj, a shimmering spire that developers Emaar contend can be seen from as far away as 96 km, will literally dwarf all these structures, with its nearest rival - the 363 metre Almas Tower - less than half as tall. Architects concede that Emaar's showpiece structure - set in the $20 billion 500 acre development in New Dubai - is an engineering marvel. The Burj, which means tower in Arabic, is over 300 metres taller than Taipei 101, the erstwhile tallest building at 509.2 metres, and comfortably towers above the KVLY-TV mast in North Dakota in the US, the world's tallest man-made structure at 628.8 metres. Designed by Chicago-based Skidmore, Owings & Merrill, Burj Dubai is being constructed by high-rise building experts from South Korea's Samsung Corp. When completed, Burj Dubai should meet all four criteria listed by the Council on Tall Buildings and Urban Habitat (CTBUH), which classifies the world's tallest structures. CTBUH measures the height of buildings on the basis of spire height, the highest occupied floor, roof height and pinnacle height. The super-tall structure will have residences, commercial space and hospitality elements, including the world's first Armani Hotel and Armani Residences. 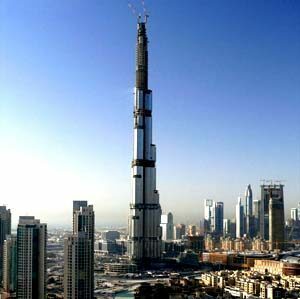 It remains to be seen, however, how long Burj Dubai will hold the top slot among the world's tallest buildings.